Stream Yusha Assad's "With Great Care: The Dream"
Is this the end of the road for SWV? Last week, on the hit series, SWV Reunited, was about Coko looking for her older son, Jazz because he is due for court and he is charged for vandalism. Coko tells the girls that a gospel label wanted them to do a song but the girls are not feeling it and tells her to make a decision whether to stay with SWV or not. This season has been one crazy one with the girls still having issues with each other after breaking up and the diva attitude of Coko. But this week, the girls decide their fate with the group as there are problems with their old label. Eddie and Taj are looking for houses while they are in New York because of the job Eddie might get. As the girl get ready for their deal with Sony, they discovered that they are not out of their contracts with their old label, Mass Appeal Entertainment and none of the girls are happy about it. They haven’t told Jeff because they thought that the label situation was handled by their lawyer and Coko is not feeling the deal with Marcus. 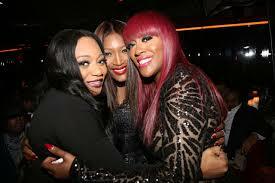 Coko finally finished with her gospel record, “At Your Feet” and the other girls love the song. They all came to an agreement that she is going to do her gospel career while with the group. The girls get ready for their concert at the Greek Theater in Los Angeles but before they go on stage, Eddie tells Taj that he got the job but making her happy, he turned the job down. The girls killed it while performing some of their greatest hits on stage. After the show was finished Coko tells them that she is going back to gospel and that she doesn’t want to work with Marcus. The other girls were mad about her decision. Hopefully they will get another season and then we get a chance to see if they stay together.